Want to know more about Denver Performing Arts Complex and other free events around Denver? Sign up for the Arts & Venues Newsletter. 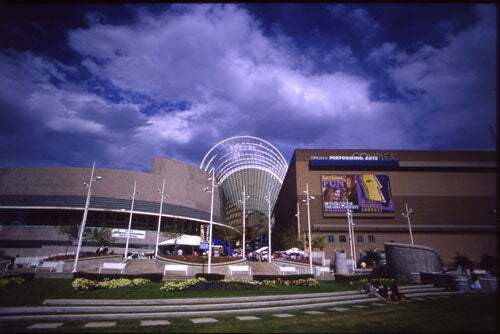 The Denver Performing Arts Complex is the largest performing arts center under one roof in the country. Connected by an 80-foot-tall glass roof, the Arts Complex houses ten performance spaces on its four-block, 12-acre site, including the historic Ellie Caulkins Opera House, the Buell Theatre and Boettcher Concert Hall, each with their own charm and character. The Arts Complex is home to four signature resident companies: Colorado Ballet, Colorado Symphony Orchestra, Opera Colorado and the Denver Center for the Performing Arts which offers Broadway shows, Tony-winning theatre, cabaret and experimental productions. For more information, visit the Denver Performing Arts Complex official website.